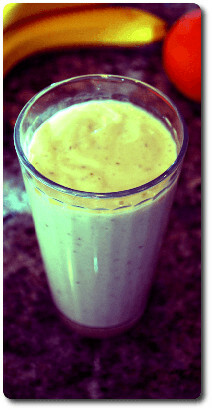 This avocado smoothie has a tropical taste, thanks to orange and banana! Peel and halve banana. Wash, halve, and pit avocado. Add orange juice, ice, banana, and yogurt to blender in that order. Scoop out avocado, avoiding pit. Blend until smooth (generally until ice has blended). We prefer orange juice with pulp, to give the smoothie a little extra texture. For extra fiber, you could use a (clean) whole (medium) orange, peel and all. We prefer fresh bananas, but you can use a very ripe but frozen banana and elide the ice cubes. The riper the avocado, the stronger the flavor. The orange does a nice job of balancing it out, but you'll have to adjust the ratio of banana to avocado if you let the avocado go too ripe. If the avocado's too hard to scoop, it's not ripe enough. For an extra burst of flavor, add a pinch of (flavored) salt or a teaspoon of brown sugar.